* Works by Women SF tracks local events and keeps us up to date on national and international theatre trends. WomenArts will celebrate the amazing Bay Area women's theatre community with two special events this month: WomenArts Night at PlayGround on Monday, March 16 and SWAN Day Bay Area on Saturday, March 28. 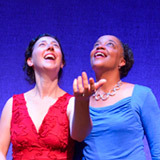 WomenArts will present an evening of six ten-minute plays about women in collaboration with PlayGround, the Bay Area’s leading playwright incubator, on Monday, March 16 at 8 p.m. at Berkeley Repertory Theatre, 2025 Addison Street, Berkeley, CA. The 48 playwrights in PlayGround's development program have been given four and a half days to write ten-minute plays on the topic, Herstory: The Greatest Stories Never Told. Martha Richards and Christine Young of WomenArts will review the scripts with PlayGround's Artistic Director Jim Kleinmann and others this week, and then the top six plays will be rehearsed with professional actors and directors for one-and-a-half hours each and presented as script-in-hand staged readings at WomenArts Night as part of the monthly series, Monday Night PlayGround. WomenArts is delighted to be collaborating with PlayGround because of the company's long-standing commitment to gender parity, both on and off stage. Half of PlayGround’s company of writers, actors and directors are women, and PlayGround has been recognized by the International Centre for Women Playwrights with a 50/50 Applause Award for 2014 because 50% of the plays they produced last year were written by women. Buy Tickets At The Door - $20. Saturday, March 28 at 3 p.m.
WomenArts will host a special Support Women Artists Now Day/SWAN Day celebration of Bay Area women in theatre on Saturday, March 28 at 3 p.m. at Shotgun Players' Ashby Stage, 1901 Ashby Ave, Berkeley, CA. Click Here to Reserve Your Seats for SWAN Day Bay Area! Celebrate & strategize with us at a special networking reception following the show. Martha Richards is celebrating her 20th year as Executive Director of WomenArts. In 2008 Richards and film critic Jan Lisa Huttner created Support Women Artists Now Day/SWAN Day. In the first seven years of this new holiday, there have been over 1,200 SWAN events in 24 countries. This year, there will be events all over the U.S, and in Burundi, Bulgaria, Canada, Czech Republic, Finland, Kenya, Nigeria, Tanzania, Turkey, and New Zealand! Richards will speak about the remarkable growth of SWAN Day and the increasing interest in gender parity in the arts in the U.S. and elsewhere. Four Ten-Minute Plays - To provide a sample of the talented women artists in the Bay Area, WomenArts will present four ten-minute plays - three on the theme of Herstory: The Greatest Story Never Told from the WomenArts Night at PlayGround, and an excerpt from Katie May's Abominable presented by Symmetry Theatre, another local company that practices gender parity in its casting and play selections. Valerie Weak has been collecting statistics on women actors, directors, and playwrights at Bay Area theatres for the past three years through her Counting Actors Project. She now has over 500 plays in her database. She will release the cumulative summary of her findings for the first time at SWAN Day Bay Area. Networking Reception - Following the show, audience members will be invited to stay for a free wine and cheese reception where people can network and continue the conversation about the best ways to advance women artists in theatre. WomenArts is especially proud to present SWAN Day Bay Area at Shotgun Players' Ashby Stage, because Shotgun Players has just announced a full season of plays by women including six mainstage plays and six staged readings. Bravo!!! WomenArts Night at PlayGround will feature 6 ten-minute plays inspired by Women's Herstory. SWAN Day Bay Area will showcase local women in theatre, share the facts about our employment, and stimulate discussion about ways to achieve gender parity in our community. Click Here to Reserve Your Free Tickets Now! Celebrate SWAN Day In the Bay Area All Day! If you are in the Bay Area and want to celebrate SWAN Day all day on March 28, it is easy this year. Start your day at SWAN Day Martinez, an outdoor visual and performing arts fair held at the Old Train Depot parking lot in Martinez. Then come to WomenArts' free SWAN Day Bay Area at Ashby Stage in Berkeley from 3 p.m. - 5 p.m. In the evening, you could return to Ashby Stage at 8 p.m. to see Anne Carson's Antigonick, the first play of Shotgun Players’ all-women playwrights’ season, or head over to the East Side Arts Alliance, 2277 International Boulevard in Oakland for a 7 p.m. reading of Out of Control, a new play by Opal Palmer Adisa presented by the Lower Bottom Playas.